We are reporting on the cover of this issue that after 12 years in office Mike D’Amato is not running for re-election. Although Mike has not formally announced his intentions, his legislative assistant, a young man with political ambitions of his own, is out doing doors and declaring his intentions to run for the job. Another city hall employee reported Mike said he was not running and asked the person to support his assistant for the post. 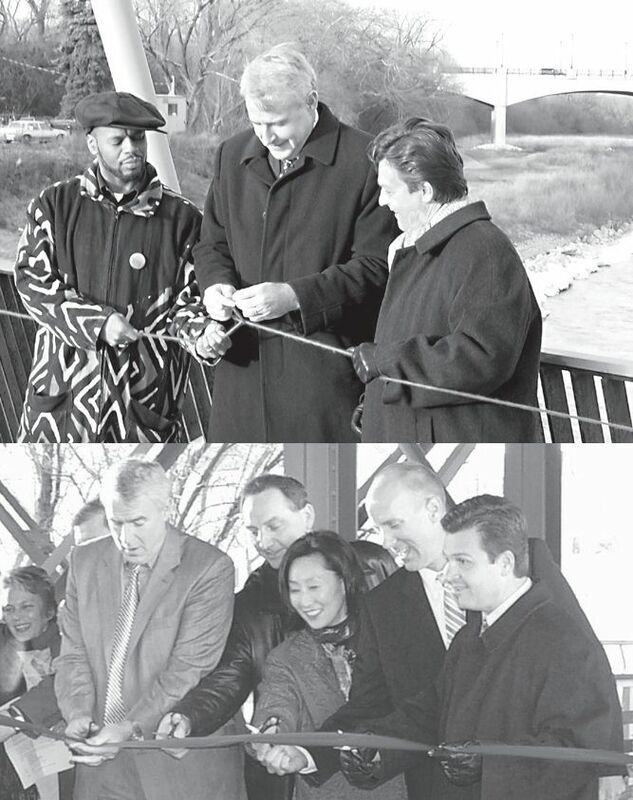 In the top photo to the right we see Mike tying a ribbon on the bridge at the old dam that joins neighborhoods. The Mayor and the other Mike still in office join him there. In the next photo below Mike and dignitaries celebrate the opening of the marsupial bridge that hangs below the Holton Street bridge. How many ceremonies, meetings, phone calls, parades, decisions, ribbon tyings and ribbon cuttings, does it take to make a public official? How many friends and enemies does an alderman make in 12 years? Even though I believe it is time for a change in office, time for someone new with different perspectives to be alderman, the news that Mike is going gave me pause. Public office can be a thankless task. Everyone has a gripe and the tone of public discourse can be exceedingly rough. With a little sadness but also a little cheer I wish Mike and his family well and wish him success in his future endeavors. Thanks for the years of service. Oh, and if he is running he should have returned our calls. My hope is that the tone of the debate for the election of the next alderman for the 3rd district be civil. That the candidates “say what they mean and mean what they say”. That may be too much to ask but it is my dream.